Ready to go from side hustle to CEO by making passive income your main squeeze? Want the steps to making consistent sales without a huge team or posting on instagram 24/7? Ready to take your digital product(s) and turn them into a profitable, scalable company? Create a thriving business with consistent sales of your digital products, like courses, memberships or digital downloads. Using automated email funnels you can scale your business on auto-pilot, so that you can do what you want, when you want. Want my method to getting more consistent sales (with ease)? Snag your spot at our free 60-minute training, Side Hustle to CEO: The 5-step method to consistent sales & passive income on autopilot. Make sure to bring your notebook, pen, and a list of how you’re trying to sell your product right now (hint: that list will change after you’ve watched the class). I have two young kids, a wonderful husband, a home I love, and a multiple 6-figure passive-income business that gives me the freedom to work from home, take random Wednesdays off to play with my kids, volunteer in my community, travel, and live the life I want. I have always had big dreams and an unwillingness to compromise on them, and you should too. So, what is The Passive Project? 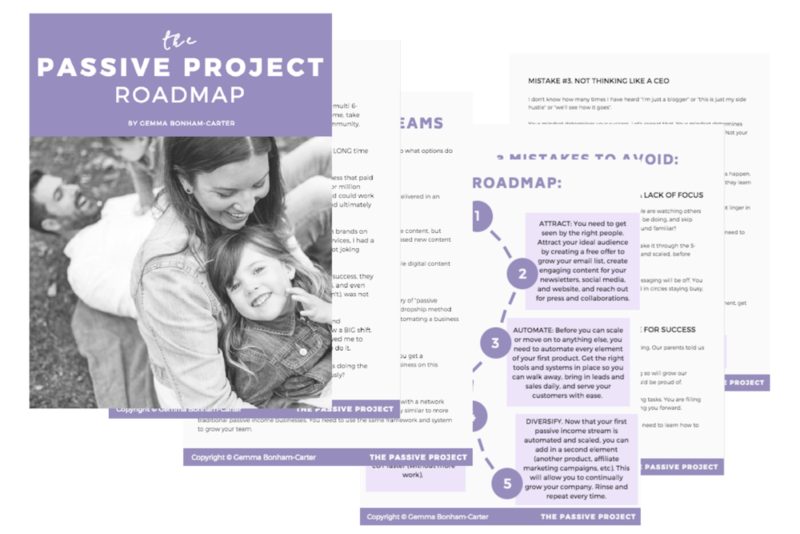 The Passive Project membership is your spot for the education, resources, community and guidance you need to create automated funnels in your business that bring in consistent sales and grow your business. The Passive Project gives you access to The Passive Project METHOD: My 5-step method for creating consistent sales using automated email funnels. The Method includes 5 comprehensive modules with video lessons, tutorials, workbooks and more that take you step-by-step through how to create, build, and scale your business using funnels. We're going to take you from spinning your wheels to data-driven CEO, babe. You also get access to new monthly masterclasses with guest experts. We host monthly Q&A calls AND hot seat calls to discuss latest strategy and dive into YOUR business (yep, you can get my eyes on your biz for a hot seat session!). We get together every quarter for Biz Planning Sessions to set goals and map out our next 90 days. We send you a weekly accountability email (ie. our love note). And you get access to an amazing private Facebook community, with the ongoing support and accoutability you need to implement what you’ve learned. ...and build that freedom-based business I know you're capable of. Want the step-by-step guide on how to create a thriving passive-income based business? Snag The Passive Project Roadmap! I love hanging out on instagram and sharing my best biz tips and more. Come say hey! Home - What is The Passive Project?